Clover - Friend or Foe? Creating healthy landscapes is the foundation for effective pest management. You can maintain your plants' health by providing adequate moisture, sufficient nutrients, and good soil. Doing so will mean they will be strong enough to out-compete their enemies and attract fewer pests. Plants are constantly defending themselves from enemies and are most vulnerable when they are stressed, weak, or unable to adjust to conditions. There's more than one way for your lawn to be healthy. Reducing or eliminating pesticides is a healthy option for your family, pets, and neighbours. A healthy lawn is created by feeding the soil rather than the grass. If you nourish the soil, most weeds will be crowded out over time. Xeriscaping is water conservation through creative landscaping. The principles of xeriscaping can be applied to any landscape style and can be as plain or elaborate as you desire.The term is pronounced "zair-i-scape" and means "water conservation through creative landscaping." Xeriscape is not "Zeroscape", it combines the Greek word "xeros," meaning dry, and "scape," meaning view. The most significant benefit of xeriscaping is reduced water use. In fact, xeriscape require 50% (or less) water than a tradtional landscape. Even better, xeriscaping usually requires less fertilizer, less pruning, and less mowing. When prevention hasn't worked effectively, gardeners use Integrated Pest Management (IPM) to deal with pests. Integrated Pest Management will help you control weeds, deter damaging insects or disease, and discourage other nuisances. Healthy soil supports healthy life and is the best way to prevent weed growth and deter insect pests and plant disease. Plants need soil for support, air, water and nutrients. Of all insect species we encounter, 95-99% are beneficial or harmless. So, instead of banishing all insects, invite some wonderful garden helpers over. Use plants such as cosmos and dill to attract guests like ladybugs and lacewings: they love to dine on aphids, mealybugs and scale insects. Learn more here. Selecting the right plant for the right place provides an advantage over pest problems. In our semi-arid climate drought tolerant plants thrive. Most plants are given a hardiness rating according to temperature zones, with Zone 1 being coldest to Zone 10 being the mildest. 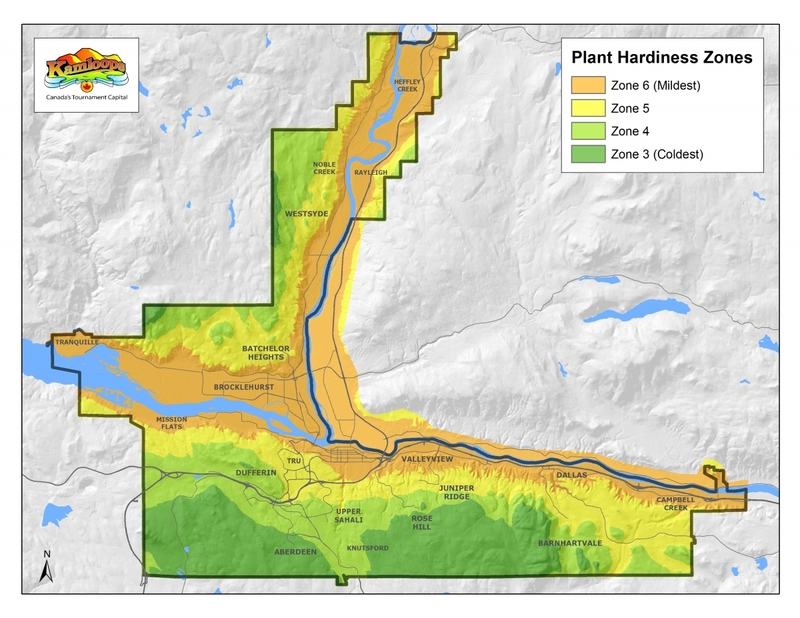 Our Kamloops climate ranges between zones 3 at its highest levels, to Zone 6 at the valley bottom. A Kamloops lawn doesn’t need to be watered every other day. It only requires about 2.5 cm (1”) per week to keep it green. Water one to two days per week depending on weather and soil conditions (sandy soils drain faster than silt or clay soils). Read more on how to water lawn properly. Mulching is an important part of a healthy landscape. Mimic nature by adding a layer of organic matter; mulches are applied to the soil surface to reduce evaporation, enrich soil, protect roots and to moderate soil temperature. Mulches also help to control weed growth and erosions. Learn more on mulching.